The Global portion of Hard Rock Rising is under way! 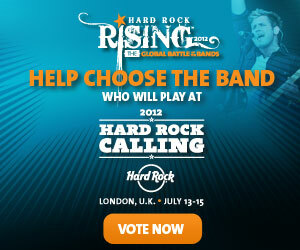 Here is what you can do to help us secure a chance to play at Hard Rock Calling Festival in London this summer. Voting begins Monday, April 9th and goes through midnight on Sunday, April 22nd. You may only vote once so it is a big help if you share this opportunity with others through any outlet you can think of. Facebook and Twitter come to mind. Use #hrrising to help trend. If we get into the top 10 for voting we will be reviewed by a panel of who’s who in the music industry to be considered for the grand prize.